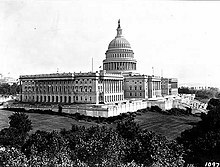 The Sixty-third United States Congress was a meeting of the legislative branch of the United States federal government, composed of the United States Senate and the United States House of Representatives. It met in Washington, D.C. from March 4, 1913, to March 4, 1915, during the first two years of Woodrow Wilson's presidency. The apportionment of seats in the House of Representatives was based on the Thirteenth Census of the United States in 1910. Both chambers had a Democratic majority. March 4, 1913: Woodrow Wilson became President of the United States. March 9, 1914: The Senate adopted a rule forbidding smoking on the floor of the Senate because Senator Ben Tillman, recovering from a stroke, found the smoke irritating. December 23, 1913: Federal Reserve Act, ch. 6, 38 Stat. 251, 12 U.S.C. § 221, et seq. October 15, 1914: Clayton Antitrust Act, ch. 323, 38 Stat. 730, 15 U.S.C. § 12, et seq. Map showing Senate party membership at the start of the 62nd Congress. Red states are represented by two Republicans and blue by two Democrats. Purple states are represented by one senator from each party. Democratic Caucus Secretary: Willard Saulsbury Jr. Most Senators were elected by the state legislatures every two years, with one-third beginning new six-year terms with each Congress. A few senators were elected directly by the residents of the state. Preceding the names in the list below are Senate class numbers, which indicate the cycle of their election, In this Congress, Class 3 meant their term ended with this Congress, requiring reelection in 1914; Class 1 meant their term began in the last Congress, requiring reelection in 1916; and Class 2 meant their term began in this Congress, requiring reelection in 1918. James M. Baker of South Carolina, elected March 13, 1913. Chaplain: Edward Everett Hale, Unitarian, until March 13, 1913, F.J. Prettyman, Methodist, elected March 13, 1913. Clerk: South Trimble of Kentucky, elected April 7, 1913. Sergeant at Arms: Robert B. Gordon of Ohio, elected April 7, 1913. Doorkeeper: Joseph J. Sinnott of Virginia, elected April 7, 1913. Postmaster: William M. Dunbar of Georgia, elected April 7, 1913. Chaplain: Henry N. Couden, Universalist, elected April 7, 1913. Official Congressional Directory for the 63rd Congress, 1st Session. Official Congressional Directory for the 63rd Congress, 2nd Session. Official Congressional Directory for the 63rd Congress, 2nd Session (1st Revision). Official Congressional Directory for the 63rd Congress, 2nd Session (2nd Revision). Official Congressional Directory for the 63rd Congress, 3rd Session. Official Congressional Directory for the 63rd Congress, 3rd Session (Revision).